My GoddessGuides Intuition Cards are very different from any other oracle or goddess cards. 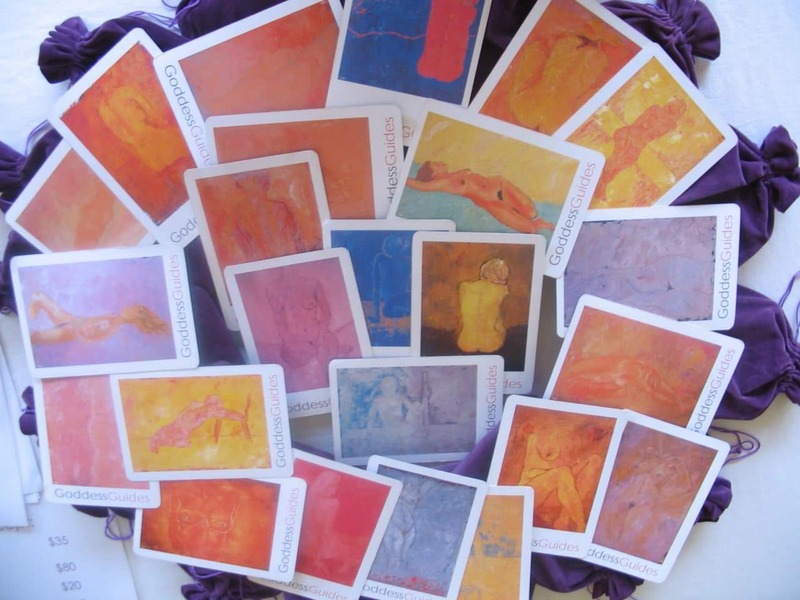 They are a deck of 24 cards featuring my Sacred Feminine series of paintings. Many have said that they are sacred healing cards. I realised only recently that they were lovingly created to guide us within for answers rather than looking for them outside ourselves. I was guided and inspired to create them in 2005 through the vision of my dear friend, Michele Sumac Claiborne. They are a tool guiding you to Find and Trust your Intuition. The Sacred Feminine paintings were a work in progress for several years before that, a completely new painting style for me greatly encouraged by the late Scott Lidgett, a wonderful artist. The text for the paintings came to me after sitting in front of each image and noting down 4 or 5 words that I felt described what that painting said. From those words, the text just flowed with ease in the form of inspirational messages. I spent several years using them on people of all ages, nationalities, male/female and from all walks of life and I was astonished to find how often people reported back that the cards were spot on in their accuracy. How can the GoddessGuides Intuition Cards help me? The Goddess Guides Intuition Cards work on a subtle level, stirring you to look deeper at a situation with which you have challenges, sharpening your intuition to see beyond the surface. They help you to find and trust your own intuition. Usually when you read a message from one of the Goddesses, your first thought will be correct (the one we usually dismiss as soon as it comes into our head!) and you will straight away know what it’s referring to. We often discount it or don’t trust what we’re given. Or we’re not ready to face that truth. It can happen that you may not ‘get’ a message or any inspiration from a message immediately. That’s ok, just let it percolate. Often it will come to you a day or two later. The benefit of the cards will be to give you greater clarity, insight and guidance with any given situation. The cards are a fabulous and exciting work in progress in as much as there are literally dozens of different ways of using them, both personally, in public and private workshops by me and others (I love hearing how you use them so please let me know). A popular way to use the cards is drawing one at random when you need guidance, or two at a time choosing one for the present and one for the future. I use them as a tool in my personal coaching and they are especially powerful in Group Coaching workshops. People who have purchased the cards use them privately for themselves, on friends, clients in holistic clinics, clairvoyance, Yoga groups, etc. You are only limited by your imagination. Do you have stories of your experience and how you use the cards? Please share them by emailing me or posting them on the Goddess Guides Facebook page.